In response to public complaints over damaged road on Jalan Bekasi Raya or precisely in the opposite of the East Jakarta Immigration Office, the related unit encouraged to conduct reparation immediately. This is because almost 3 months, the condition is endangering motorists. 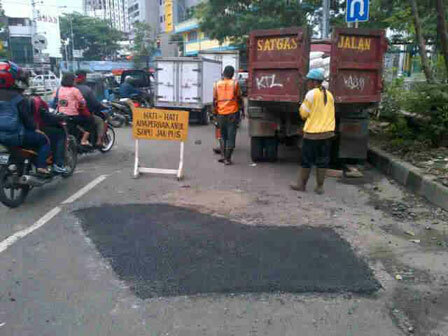 As quoted by beritajakarta.com, the road is damaged up to 500 meters. Besides asphalt road, its damage also seen on the Transjakarta corridors' barriers.
" Hopefully, Jalan Bekasi Raya could be repaired soon because many motorists fall while passing the road, especially at night"
“Hopefully, Jalan Bekasi Raya could be repaired soon because many motorists fall while passing the road, especially at night,” one of motorists, Ali, Thursday (3/12). When being confirmed, Head of East Jakarta Bina Marga Sub-Department, Juaini Yusuf stated that the maintenance and reparation are the authority of PT Jaya Konstruksi. “Such repair was already discussed in the executive meeting today. It is still the authority of PT Jaya Konstruksi as project contractor,” he explained.